To investigate the clinico-pathological prognostic factors and treatment outcomes in patients with ovarian yolk sac tumors (YST). A multicenter, retrospective department database review was performed to identify patients with ovarian YST who underwent surgery between 2000 and 2017 at seven Gynecologic Oncology Centers in Turkey. The study group consisted of 99 consecutive patients with a mean age of 23.9 years. While 52 patients had early stage (stage I–II) disease, the remaining 47 patients had advanced stage (stage III–IV) disease. 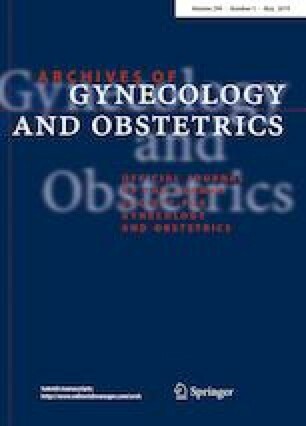 The uterus was preserved in 74 (74.8%) of the cases. The absence of gross residual disease following surgery was achieved in 76.8% of the cases. Of the 54 patients with lymph node dissection (LND), lymph node metastasis was detected in 10 (18.5%) patients. Of the 99 patients, only 3 patients did not receive adjuvant therapy, and most of the patients (91.9%) received BEP (bleomycin, etoposide, cisplatin) chemotherapy. Disease recurred in 21 (21.2%) patients. The 5-year disease-free survival (DFS) and overall survival (OS) in the entire cohort were 79.2% and 81.3%, respectively. In multivariate analysis, only residual disease following initial surgery was found to be significantly associated with DFS and OS in patients with ovarian YST (p = 0.026 and p = 0.001, respectively). Our results demonstrate the significance of achieving no visible residual disease in patients with ovarian YST. Fertility-sparing approach for patients with no visible residual disease affected neither DFS nor OS. Although high lymphatic involvement rate was detected, the benefit of LND could not be demonstrated. GB: project development, data collection, manuscript writing. YD: project development, data management, manuscript writing. IC: manuscript writing, manuscript editing. OK: data collection, manuscript writing. EB: data collection. GKC: manuscript writing, manuscript editing. HS: data collection. HA: data collection. IU: manuscript writing, data management. AK: manuscript writing, data management. MMM: manuscript writing, data management. MCS: project development, data management, manuscript writing. NO: project development, data management, manuscript writing. AO: project development, data management, manuscript writing. TS: manuscript writing, manuscript editing. KY: manuscript writing, manuscript editing. TT: project development, data collection, manuscript writing, manuscript editing. There are no potential conflicts of interest to declare and no relevant sources of funding for this study.